When “The Hangover” struck in 2009 it was a perfect comic cocktail – a fresh story structure, a cast and script that understood what they had and, most importantly, R-rated laughs that weren’t cheap and born from the plot and the characters operating within it. 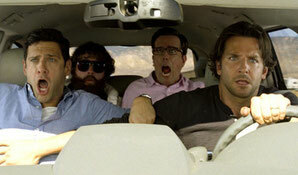 Its success meant a sure sequel, and “The Hangover Part II” went the route of straight-up carbon copy with mixed results. But it made another boatload of cash, so now what to do for the third installment? I’m not sure what could be done to keep an audience interested in the Wolfpack and their follies, and apparently director Todd Phillips and his co-writer Craig Mazin had no idea, either. The filmmakers chose to open with an endearing giraffe decapitation. Always hilarious. Animals don’t fare too well in the film as later a group of roosters are shot, thrown out of windows and slowly suffocated and two dogs have their necks broken. Thankfully (I suppose) the dog deaths are off-screen. It’s okay though, they make a few PETA jokes to remind us this is only a silly movie. But also an unfunny one. Besides, something has to fill the runtime, why not animal cruelty? There isn’t any fun comedy to speak of. There’s a lot of driving in the movie, but it’s not a road film. There are a few action set pieces that lack any excitement. Gangsters, double-crosses and heists don’t amount to anything. “The Hangover Part III” may have one accomplishment – creating a new genre of film that defies classification because it’s so tedious and insensible. The plot focuses entirely on two characters that are best in small doses, both of whom used up all of their charm long before the credits of Part II rolled. Mr. Chow (Ken Jeong) escapes from a Bangkok prison and becomes the target of fellow gangster Marshall (John Goodman), from whom he’d stolen $21 million in gold. Meanwhile, after the socially demented Alan (Zach Galifianakis) kills the giraffe his family and friends stage an intervention to send him to therapy in Arizona. En route the crew is intercepted by Marshall and his goons, Doug (Justin Bartha) is kidnapped and held as insurance, and the Wolfpack is mandated to find and deliver Chow. Bradley Cooper and Ed Helms, who play Alan’s partners in debauchery Phil and Stu, respectively, look like they’d rather be anywhere else than making another Hangover. Stu’s job is give a high pitched yell every now and then to let us know how out-of-control things are getting, while Phil is there to remind us that everything is ‘f’ng stupid’ and, really, ‘who gives a f***?’ Which is actually a poignant question when it comes to this film. The only energy in the movie comes from the new characters – the way-too-underutilized Goodman as Marshall and Melissa McCarthy as the pawn shop owner who shares a weird attraction with Alan. Unfortunately, Goodman is used largely to growl exposition and McCarthy is limited to two scenes. What we’re left with are the increasingly uncomfortable antics of Alan and the grating, cocaine-fueled psychotic Chow. I find Galifianakis and Jeong both funny performers, but with these characters there is nothing they can do at this point to inject life. A couple of supporting characters return from the first film in the series, but in ways so uninspired and pointless it can’t possibly conjure any positive nostalgia. As things wrap up, Philips becomes so desperate to remind us of the good time we had in 2009 he intercuts images of the original film as if we’ll get the warm-fuzzies and forget how bad Part III really is. The poster claims that “The Hangover Part III” is the “epic finale” of a trilogy. It certainly isn’t epic, but let’s hope it’s the finale.